McBusted are an English pop rock supergroup composed of members of bands Mcfly and Busted. 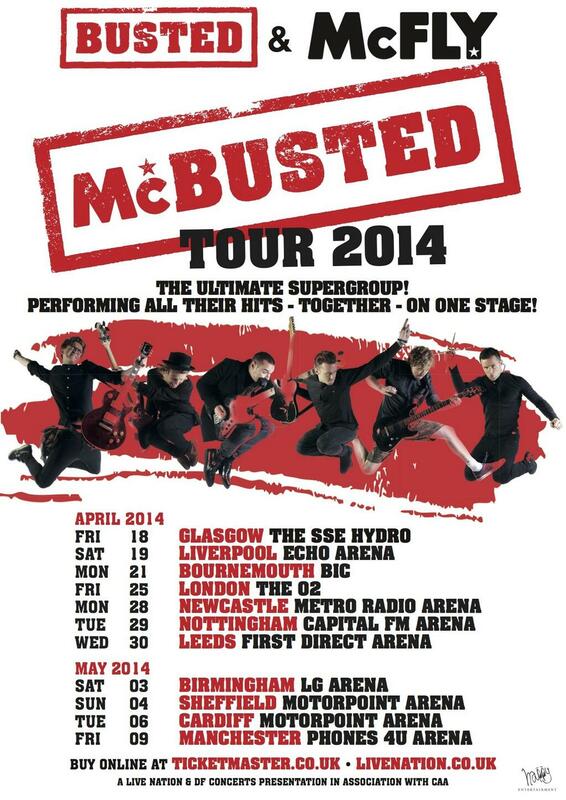 The only member of the original groups not participating in the new lineup is former Busted singer Charlie Simpson. It was announced on 11 November 2013 that James Bourne and Matt Willis would join McFly’s Tom Fletcher, Danny Jones, Dougie Poynter and Harry Judd to form the six-piece supergroup McBusted and go on an arena tour in April and May 2014. Simpson opted not to be a part of McBusted as he wished to focus on his solo career. The original eleven-concert McBusted tour quickly sold out and has since been extended to 34 shows, including headlining Hyde park on 6 July 2014. I couldn’t believe that this was real it seemed too good to be true! I was gutted when Busted split up in 2005 and because of that i’ve never bothered listening to Charlie’s solo stuff since he’s the reason they broke up. Hearing that they might be getting back together and joining Mcfly was just amazing, it’s like bringing you back to your childhood only now you realise how inappropriate some of the songs were for a 10 year old to be singing, but oh well no one cared back then. I went to the first night of the tour in Glasgow on the 17th of April, the only bad things about the night was the delays, we were left queuing inside for over an hour then when we finally got to our seats we were left waiting for another hour before the support act even started which wasn’t until like half 8. The support was ‘Young Brando’. They played three songs which were actually a lot better than expected. You should look them up as they are a new band and not very well known. The crowd was pretty fed up by the time McBusted finally came out on stage but wow they definitely didn’t disappoint. They started off with Air Hostess and had everyone on their feet. The atmosphere in the arena was just amazing! Everyone was singing along with all the songs. It was so brilliant and have to say it was one of the best concerts i’ve ever been to second only to Bryan Adams! They played everyone’s old Busted favourites from ‘Sleeping with the light on’ to ‘Thunderbirds’ and of course there was the Mcfly hits as well from ‘All about you’ to ‘Five colours in her hair’. There was something for everyone and no one was disappointed. The staging was insane it was as if they had sat down in a room and said ‘I want this, this, this and this. Go make it happen.’ It’s no wonder there was such a long delay for technical difficulties! The UFO was amazing staging and must have been terrifying for the band flying down from the roof and hovering over the sound guys. The band looked as if they were just a group of mates hanging out and singing songs together. Their friendship was clear to see it was just amazing and it was more like a bromance between some of them. Matt and Dougie were pretty much together the whole time. Even walking out there was guys singing in the street and smartly enough were singing Busted songs and everyone in the crowd started chanting along with them, it was like they had created an army united by the music and love of McBusted.